I will be the first to admit I hated camping when I was younger. I wanted a five-star service minus the bugs and dirt, please. But since growing up and fostering an appreciation for the great outdoors and music festivals, camping has become a go-to on weekends, holidays and impromptu adventures away. Nothing beats hiking the nearby wilderness and being bundled up by campfire staring at the stars! 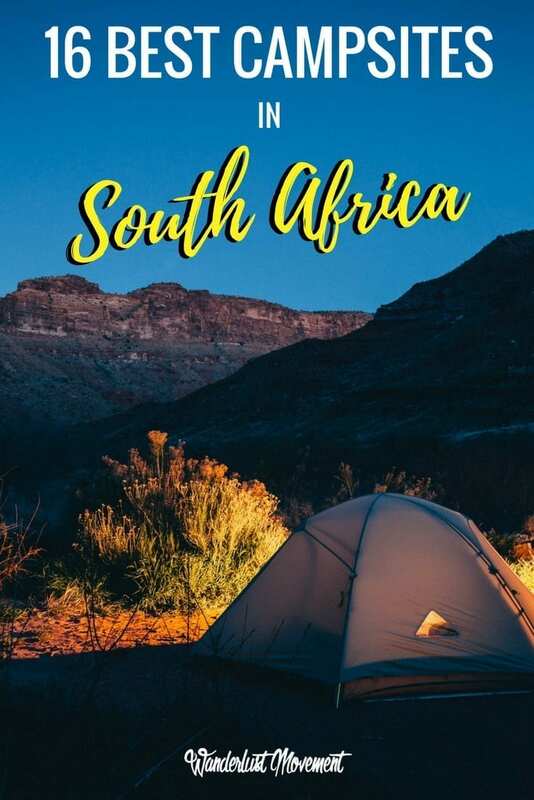 Whether you prefer disconnecting on the beach, frolicking in the forest or losing signal in the mountains, campsites in South Africa have something for everyone. 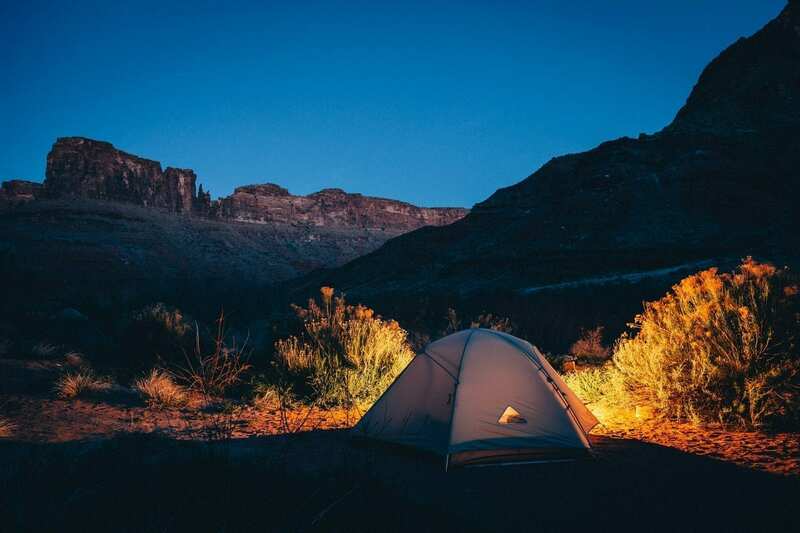 Here are some of the best campsites in South Africa! In a valley surrounded by the majestic Drakensberg Mountains, lies the Mahai River Campsite inside the Royal Natal National Park. It boasts numerous hiking trails from the campsite varying in length, or you can take a drive and spend a day conquering Tugela Falls – the highest waterfall in Africa. The baboons are sneaky here so be sure to keep your food and belongings locked up when you are not around. Communal ablution and washing up facilities. 44 electric and 40 non-electric campsites. Tietiesbaai is one of the best campsites in South Africa and the Western Cape. Outdoor lovers flock here to enjoy a more basic camping experience, while spending their days hiking around the coastline, watching incredible sunsets and visiting the small town of Paternoster. Shared ablutions facilities with warm showers. 60 camping sites, no electricity. Bushwhacked Adventurers’ Fiddler Creek Campsite offers travellers an enviable spot along the banks of the Orange River. It is a beautiful wilderness escape with the perfect balance between glamping and roughing it. If you are feeling adventurous and have the time, book a 3 to 4-day river rafting trip that will take you into Namibia and back. Electricity and a built-in braai area. 14 grassed campsites 200 m from the water. Hot showers with flush toilets. Camping in the Storms River Mouth Campsite inside the Garden Route doesn’t get any better. You are surrounded by some of the region’s most breathtaking views with plenty of opportunities to scuba dive, look out for the southern right whale coming inshore to breed or exploring the beginning of the renowned Otter Trail. With all of this epic natural scenery at your fingertips, its one of the best campsites in South Africa. Communal ablution, laundry and washing up facilities. Looking for a secluded camping getaway in South Africa? Head to Mabibi Beach Camp. There’s no electricity or drinking water, and you will need a 4×4 to get there, but you will be rewarded with incredible views of the coastal forest. Make your way down 130 wooden steps to the beach, and you might even spot loggerhead and leatherback turtles nesting! Eight sites but number 3 is closest to the beach. Braai area and hot showers. Nature’s Valley is perfect for campers who are avid hikers and bird lovers. Situated on the banks of the beautiful Groot River, explore the area with a canoe or choose one of the many day trails inside the lush forests. If you want to camp right next to the ocean and experience the West Coast raw and unfiltered – Kwass se Baai campsite in Namaqua National Park offers all that and more. Charge your camera and prepare yourself for epic sunsets and wildlife spottings like the smallest tortoise on Earth, antelope and the Namaqua speckled padloper. Four camping spots with windbreak walls and a braai area. No water or electricity, environmental toilets. 4×4 is required to reach the camp. Located along the banks of the Breede River, Elsie’s Kraal is one of the best campsites in South Africa for stunning views of the Langeberg Mountains. Explore the nearby area by going on a self-drive game safari, kayak along the river or conquer one of the beautiful hiking trails. Communal picnic and braai sites and ablution facilities. The Great Karoo offers travellers a vast landscape that is home to the largest ecosystem in South Africa. Its award-winning campsites can be found in a green oasis, and the park itself offers plenty of opportunities for game viewing as well as the famous Fossil Trail that depicts the geology and palaeontology of the area. All caravan sites are equipped with 220v power points. Umlalazi Nature Reserve is nestled amongst beautiful sand dunes and coastal forests. It is home to one of the rarest birds of prey in the country as well as plenty of duiker and Itsa. It’s unique location and wildlife make it one of the best campsites in South Africa and it’s well worth the visit. If camping inside Pilanesberg National Park sounds like your idea of heaven, add Bakgatla to your bucket list. Located at the foot of the Garamoga Hill, it puts you right in epicentre to experience some of the area’s best activities such as game drives, balloon safaris and hiking and spotting 35 species of large mammals and over 300 different kinds of birds. 40 campsites with electricity, 60 campsites without. Just 18 km from the small town of Citrusdal, campers will find the rustic The Baths Resort. It is home to mineral-rich hot springs and hiking trails with beautiful views over the Olifants River Valley that make for a relaxing weekend away. Camp in the southernmost forest in Africa, beneath Milkwood and yellowwood trees – some over 1000 years old! Platbos Forest is one of the best camping sites in South Africa to get off the grid and spend your days hiking through the forest, horseback riding or exploring the nearby beach. Open-air hot shower, fully equipped kitchen, no electricity but gas is available for cooking. Two already pitched tents included in the price and all linen, towels and bedding are provided. Located roughly one hour from Cape Town, is one of the most beautiful camping spots in the Western Cape. Tweede Tol forms part of the Limietberg Nature Reserve and is teething with wildlife, fynbos and numerous hiking trails. 20 standard campsites and 7 fenced off private sites. Designated braai areas, hot showers, and communal ablution facilities. Named after the peak between Champagne Castle and Cathkin Peak in the Northern Drakensberg, Monk’s Cowl rest camp is a gateway to some of the most scenic mountain views in South Africa. It is one of the best camping sites in the Drakensberg and is a haven for avid hikers with routes varying from a few hours to several days. Communal ablution blocks with hot showers and flush toilets. Situated in a thriving green oasis inside the Kruger National Park, Letaba Camp is one of the oldest and largest campsites. The best part? You don’t even need to leave the camp to view the wildlife with bushbuck wandering freely and plenty of opportunities to spot the varied bird population – especially owls. What are the best campsites in South Africa in your opinion? Psst…Want more South Africa travel inspiration? Check out my other posts! We made the trek to Mabibi Beach Camp this past summer and let me tell you, it was sooo worth the trip. Easily one of the top 3 campsites I’ve ever had the pleasure of staying at – although be warned, both getting there and camping there are a challenge, so it’s definitely not a campsite for the inexperienced.